We know that some of our fans are ready to start planning for their wedding day, and what better way to start than by getting inspired by our gorgeous collection of new Wedding Invitation Suites? We asked our designers to pick their favorite and share with you. Even if you can’t hear wedding bells just yet, you can still swoon over these amazing invites. Paper Source offers exclusive, customizable wedding suites, all designed in-house by our team in Chicago. 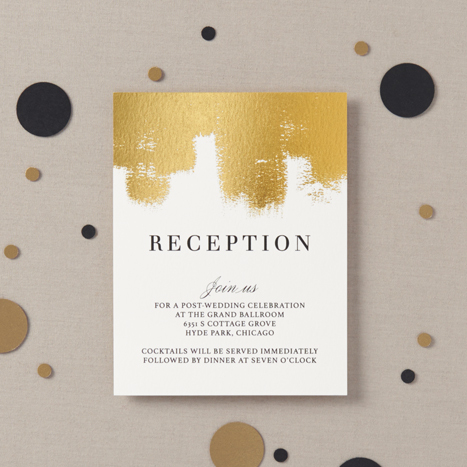 Our designers create a variety of invitations for every taste (from classic to contemporary), all while incorporating their own unique style. 1.) 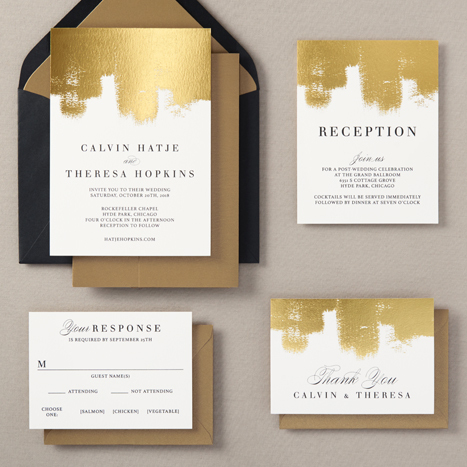 Q: Which invitation suite is your favorite this year? 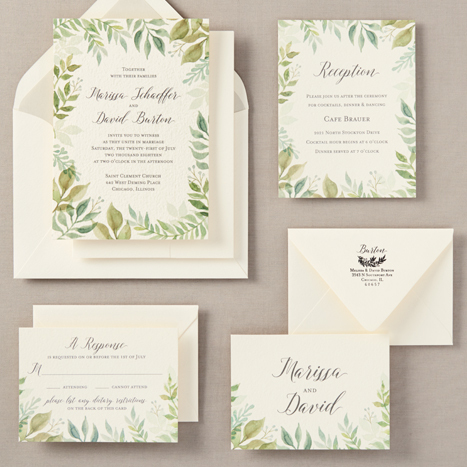 A: My favorite is a tie between the Watercolor Garden suite and the Paintbrush Foil design. 2.) Q: What do you like the most about this suite? What are your favorite elements of its design? A: I love how ethereal the watercolor is, the hand painted greenery is very pretty and soft, but it’s very diverse because there are no florals – it could go with quite a few different themes without being overly feminine and frilly. Greenery is very popular right now, especially tropical leaves, so I think this is a really nice solution that could speak to multiple customers. The foil paintbrush design is just different from anything I’ve seen, the impact of the foil is very strong. It’s artistic and modern and just really cool. 3.) Q: What inspired your designs this season? A: This season was very focused on being modern and sophisticated – we wanted to create suites that are strong, yet simple enough to let the bride really make it shine and personalize it with elements of her wedding theme – whether that’s through additional craft projects for the favors, table numbers, etc., or with the envelope and liners that are chosen. You can really change the look and feel of a design just with color choices, and we really didn’t want any of these to be limited to just one style. I would say our designs this year are classic, but not traditional, which I think bridge the gap between the world of modern and traditional. 4.) Q: Who are some of your design influencers? A: Kate Spade always does a great job of being simple, concise, yet fun and modern. There’s also a ton of inspiration from independent artists – I’ve been really inspired by the amazing watercolors by Helen Dealtry. 5.) Q: What is your favorite part of designing the wedding suites? A: Probably coming up with little stories about each bride and what she’d want for her wedding and thinking about all the little details that might accompany their suite – whether it’s an elegant, glamorous event (which would be perfect with our Chandelier Foil suite) or a springtime outdoor wedding (would go great with the Watercolor Garden) it’s fun to envision these weddings and set up a mood. 6.) Q: If you could introduce any new wedding trend you could dream up this year, what would it be? 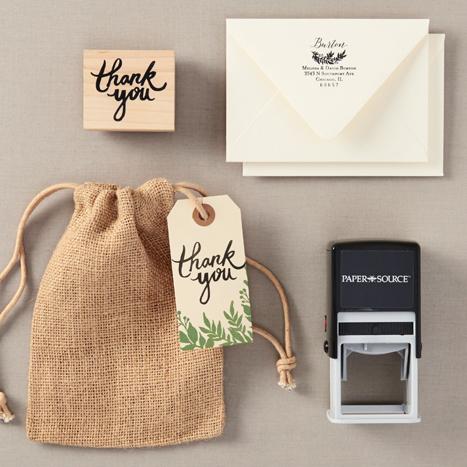 For more wedding suite inspiration, check out the whole collection at www.PaperSource.com!